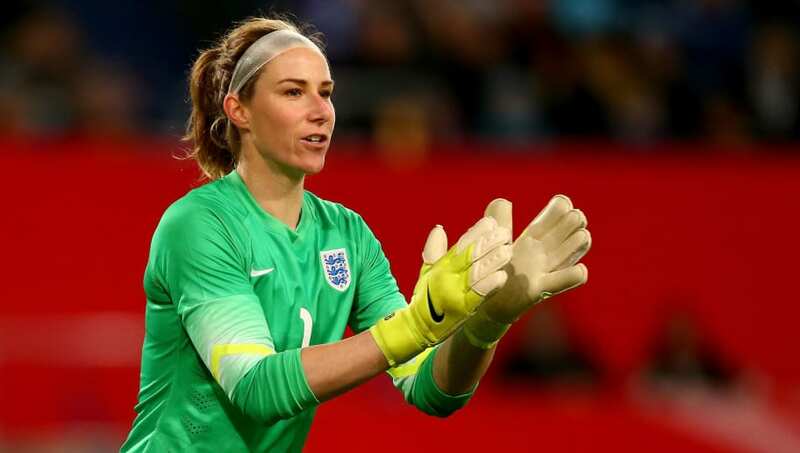 ​England goalkeeper Karen Bardsley will be going to the seventh major international tournament of her career this summer when the Lionesses head to the Women's World Cup in France. After three European Championships and the 2012 Olympic Games, it will be her third World Cup. What's more, it will be her third World Cup as England's number one if she can hold off stiff competition from Chelsea stopper Carly Telford in the final few weeks before it all begins. Although a handful of other players have more caps, none have been part of the England setup for as long as Bardsley, who made her senior debut as far back in 2005. She is also one of only five players aged 30 or older expected to be on the plane. If England are to fulfil their obvious potential and win the World Cup this year, her vast experience will be key. A commanding 5'11, Bardsley stands out on the pitch. Her accent is also a giveaway that her journey to this point has been rather different to those of her international colleagues. The Manchester City star was born and raised in California and was captivated by 'soccer' from an early age after finding it more exciting than other sports on offer, like softball. She was around five or six years of age at that time but her father, who had grown up in England at a time when women's football was actually still banned by the FA, was surprised. "I remember my dad saying to me one day 'I didn't think girls play football'," Bardsley told iNews last September as she recalled her early years. "Essentially [football] changed my life." Women's soccer was exploding in the United States during Bardsley's formative years. In 1991, a USWNT squad featuring Michelle Akers, as well as a young core of emerging superstars who would soon become household names, won the inaugural World Cup in China. When Bardsley was 14, the World Cup was played in the United States for the first time. Beating China in the final after a penalty shootout, the '99ers' captured the imagination of the American public and inspired a generation. As one television commercial for Gatorade proved, star Mia Hamm was even on a level with Michael Jordan as far as advertisers were concerned. "I grew up watching Mia Hamm, Brandi Chastain, watching them achieve," Bardsley explained in an interview with the Daily Telegraph shortly before Euro 2017. "Watching that '99 final I remember thinking, 'Wow, that is something I want to be part of'. When I got the chance with England, to push at those barriers, it's a great challenge, something I'm really passionate about." Settling as a goalkeeper around the age of 10, Bardsley continued on the path to becoming a professional footballer via the typical American route and attended California State University, Fullerton on a soccer scholarship, studying graphic design. She graduated in 2006 and set about taking the next steps in her career. But it was during her collegiate career that Bardsley also began an international journey, pledging her allegiance not to her native United States, but to England, where her parents had emigrated from. "I've lived all my life in the U.S., but to be brutally honest I don't really have any ties to the country apart from my mum and dad," she told The Guardian in 2011. "Most of the rest of my family live in the Stockport area and I've always related more to that side of my background." Bardsley first appeared for England at Under-19 level in 2003, before eventually going on to make her senior bow two years later in the Algarve Cup. But she wouldn't actually make the permanent switch to England until 2013 when she joined Lincoln Ladies. At club level, Bardsley's first opportunity after college graduation came in 2007 with Ajax America Women, a Los Angeles-based club inspired by the famed Dutch side. She then joined Pali Blues, still in LA, before her big break came with Sky Blue FC in 2009 as a third round draft pick in the brand new Women's Professional Soccer (WPS) league. Bardsley headed to Europe in 2011 to join Linkopings in the highly rated Swedish league, eventually joining Lincoln midway through the 2012/13 WSL season. She then signed with Manchester City at the end of the campaign, one of several England internationals, including Steph Houghton and Jill Scott, who made the move to the ambitious new WSL club. Internationally, Bardsley spent her first few years with the Lionesses as a back-up to number one Rachel Brown. It was as a number two that she went to her first major tournament (Euro 2009) but by 2011 she had made the gloves her own. Bardsley was an ever-present at the 2011 World Cup as England bowed out in the quarter finals after a penalty shootout defeat to France. The following year she was chosen as Great Britain number one for the Olympics and was again the starter at Euro 2013. That tournament was unfortunately one to forget for Bardsley and England. With a degree of expectation on their shoulders after reaching the final four years earlier and putting together an impressive World Cup in 2011, England flopped hard and were eliminated bottom of their group without a win. It was a 94th minute own goal from Bardsley, which saw the ball cruelly deflect into the net after striking her face, that handed Spain a 3-2 victory in the opener. Bardsley retained her place for the 2015 World Cup as England exceeded all expectations to finish third. Bardsley herself, despite an eye injury forcing her out of the quarter final, was named in the All-Star Team by FIFA's Technical Study Group, one of three goalkeepers in the combined squad alongside living legends Hope Solo and Nadine Angerer. Having already won the Continental Cup with Manchester City in 2014, Bardsley added further club success in 2016 with a WSL title, before also winning the FA Cup in 2017 to complete the full set of England's three domestic trophies. At City, serious competition has emerged since 2016 in the shape of teenage starlet Ellie Roebuck, with the youngster increasingly preferred. Bardsley has also shared international duties, mainly with Carly Telford, but also Mary Earps and now Roebuck, who made her full debut earlier this month. If nothing else, it speaks of the great depth in quality in England goalkeepers. For Bardsley, this summer's World Cup could very well be her last tournament with England after 14 years as an international. But if England are to go all the way it would be the perfect way to bow out, replicating the achievements of Hamm, Chastain and others that she watched aged 14 back in 1999, and being part of a fabled team that inspires a brand new generation of its own.